Original may still be AVAILABLE - call Disneyland's WonderGround Gallery (details below) if interested! Prints, fancy matted prints & merchandise are all available through Disney - ordering details are below. 20x24 Acrylic Painting on Panel $8400 Original (it may be possibly be still available - if you are interested, call (714) 781-4565 - they open at 10:00am Pacific Time (ask to speak to a WonderGround Gallery staff member) - comes in a huge gorgeous ornate Rococo frame (34.5"x38" in size)! Alternately you can call the Merchandise Guest Services number at 877-560-6477 (option 2) - they are happy to ship worldwide. #1 Calling by telephone: Guests can call the Merchandise Guest Services number at 877-560-6477 and can select Option 2 for Art and Collectibles which is the category that WonderGround merchandise falls under. 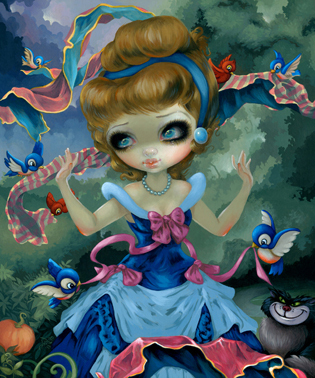 Let them know you want to order Jasmine Becket-Griffith's "Cinderella's Transformation" artwork from WonderGround Gallery and they will let you know what is available. YES they will ship WORLDWIDE. They are not on the Disney website, or any other website, only by telephone, but they are happy to ship worldwide. And again - no, I do not stock these myself, I cannot sell them myself, they are exclusive to the Disney Parks & Merchandise services and to WonderGround Gallery at Disneyland in California =) I have seen some sellers who have purchased the items up at the Gallery and have since put them on eBay second-hand, so you might try there too, but I myself do not have any of these items for sale. I went with a pop uber-Rococo/Baroque feel suitable to the 17th Century French setting of the story - choosing to depict the transformation of Cinderella! Set in the forest before the ball I decided to combine familiar elements from the Bibbidi Bobbidi Boo sequence of re-dressing with that of the earlier birds-and-mice-helping-out sequence. The twisted vines of the pumpkin are growing into the elegant carriage, and swathes of ornate billowing fabric (held up by the forest birds) are weaving into her beautiful dress, while the cat Lucifer lurks in the background (looking suitably sinister, possibly eyeing the birds).